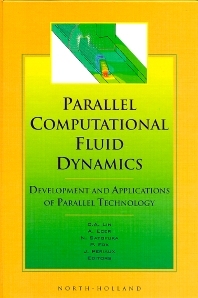 This book contains the papers presented at the Parallel Computational Fluid Dynamics 1998 Conference. The book is focused on new developments and applications of parallel technology. Key topics are introduced through contributed papers and invited lectures. These include typical algorithmic developments, such as: distributed computing, domain decomposition and parallel algorithm. Some of the papers address the evaluations of software and machine performance and software tool environments. The application of parallel computers to complex fluid dynamics problems are also conveyed through sessions such as DNS/LES, combustion and reacting flows, industrial applications, water resources and environmental flows. The editors believe this book will provide many researchers, much beyond those contributing to this volume, with fresh information and reference. 1. Invited Papers. Direct Numerical Simulation of Turbulent Channel Flow by Parallel Computation (H. Kawamura, H. Abe, Y. Matsuo). Parallel Stabilization of Navier-Stokes Equations (J.L. Lions). Simulation of Incompressible and Compressible Flows on Vector-Parallel Computers (M.Meinke, E. Krause). Turbulence Simulations on Parallel Computers (P. Moin, B.J. Boersma, J.B. Freund, A.G. Kravchenko, C.D. Pierce). Different Domain Decomposition Techniques to Solve Computational Fluid Dynamics Problems (V. Puoti, E. Bucchignani, A. Matrone). Parallel Computation of Steady Navier-Stokes Equations on Uni-Variant/Mulit-Variant Elements (T.W.H. Sheu, S.F. Tsai, M.T. Wang). The Iterative Solution of Fully Implicit Discretizations of Three Dimensional Transport Models (B.P. Sommeijer). Subsurface Reactive Transport with High Performance Computing (G.-T. Yeh, J.-P. Gwo, M.S. Siegel, P. Hopkins). 2. Combustion and Reactive Flows. Parallel Computation of Supersonic Combustion in RAMAC Device (S. Diao, T. Fujiwara). Adaptive Coupling and Time Marching for Metacomputing (M. Garbey, T. Tromeur-Dervout). Parallel Simulation of Wildland Fire Speed (J.M. McDonough, V.E. Garzon). 3. Distributed Computing. Accurate Incompressible N-S Solution on Cluster of Work Stations (A.R. Aslan, F.O. Edis, U. Gulcat, A. Misirlioglu). Adaption of a 3-D Flow-Solver for use in a Metacomputing Environment (T.P. Bonisch, R.Ruhle). Parallel Personal Computer Application of CFD++, a Unified-Grid, Unified Physics Framework (S. Chakravarthy, O. Peroomian, U. Goldberg, S. Palaniswamy). A Metacomupting Environment for Computational Fluid Dynamics (M.M. Resch, D. Rantazu, H. Berger, K. Bidmon, R. Keller, E. Gabriel). 4. DNS and LES. Shared Memory Parallelization of an Implicit ADI-Type CFD Code ( T. Hauser, G.P.J. Huang). Dynamo Action of ABC Flow (M.-J. Huang). Parallel Direct Numerical Simulation of Shock-Turbulence Interaction (S. Jamme, F. Torres, J.-B. Cazalbou, P. Chassaing). Parallelization of Three Dimensional Lattice Boltzmann Method for Incompressible Turbulent Flows (N. Satofuka, T. Nishioka). On Optical Effects of Coherent Structures in 3-D Free Shear Layers (Y.-P. Tsai). 5. Domain Decomposition. Parallel Schwarz Method for Convective-Diffusion Constituent of the Navier-Stokes Solver (M. Garbey, Y.A. Kuznetsov, Y.V. Vassilevski). Application of Local Fourier Basis to Domain Decomposition in Combustion Problems (M. Garbey, D. Tromeur-Dervout). A Block Partitioning Algorithm for Structured Multiblock Grids (C.B. Jenssen, O. Fjosne, O. Kloster). 6. Evaluations of Software and Machine Performance. Comparison between MPI and BSP Model Based on a Three-Dimensional Euler Flow Solver for High Speed Train Aerodynamics Prediction (M.-H. Chung). An Evaluation of Cost Effective Parallel Computers for CFD (D.R. Emerson, K. Maguire, K. Takeda, D. Nicole). 7. Industrial Applications The Virutal Test Bed Environment at NAL-Kakuda Research Center (S. Hasegawa, T. Sunami, M. Takahashi, M. Mochizuki, H. Miyajima, K. Itoh, M.E.S. Vogels). Automatic, Self-Adaptive Grid-Generation for Complex Geometries in 3D (C. Helf, U. Kuster, R. Ruhle). Euler/Navier-Stokes Optimization of Supersonic Wing Design Based on Evolutionary Algorithm(A. Oyama, S. Obayashi, K. Nakahashi, T. Nakamura).8. Interdisciplinary Applications. Educational Requirements for Parallel Computing and Computational Fluid Dynamics (K.J. Badcock, B. E. Richards). Parallel Computing for Fluid/Structure Coupled Simulation (T. Kimura, R. Onishi, T. Ohta, Z. Guo).9. Navier-Stokes Applications. Parallel Computation of Enhanced Turbulent Heat Transfer in a Channel with Periodic Ribs (D. Lee, W.B. Tsai, C.-H. Chen, C.C. Chieng). Numerical Simulation of Internal Cooling in Turbine Blades by using Two Layer Turbulence Model (G.J. Hwang, F.K.T. Lin). A Gridless Type Solver for Parallel Simulation of Compressible Flow (K. Morinishi). Numerical Simulation of Gaseous Slip Flow in a Turbo-Molecular Pump on Parallel Computers (Y.Y. Niu, S.C. Tcheng,, J.C. Huang). Parallel Computation of Three Dimensional Incompressible Flows Using IMEX-GEL Methods (M. Obata, N. Satofuka). Development and Application of a Pressure-Based CFD Parallel Computing Algorithm (H.M. Shang, Y.S. Chen). 10. Parallel Algorithms. Parallel Implementation of a Compact High Order Maxwell Solver (R.K. Agarwal). A Functional Parallelisation of the Spectral Transform Method (E.A. Chadwick). Determining the Communication Rates for Optimizing the Elapsed Execution Time of Parallel CFD (S. Chien, J. Periaux, A. Ecer. H.U. Akay, S. Cooper). Parallel Implicit Treatment of Interface Conditions in Domain Decomposition Algorithms (S. Kocak, H.U. Akay, E. Ecer). A Binomial Tree Based Parallel Load-Balancing Method for Solution-Adaptive Unstructured Finite Element Graphs on Distributed Memory Multicomputers (C.-J. Liao, Y.-C. Chung). Parallel Iterative Methods-Pipelined Iterative Methods on Combustion Problem (D. Lee, C.-Y. Tang, J.-F. Fang, C.-Y. Yao, I.-J. Lin). Asynchrone Parallel Genetic Algorithm for Heat Flux Otimization Problem (S. Peigin, J. Periaux, S. Timchenko). 11. Parallel Applications Adaptive Parallel Monte Carlo Simulations of Low-Pressure Plasma Processing (K.-C. Huang, J.-H. Tsai). Parallel Computing of the Space-Dependent Boltzmann Transport Equation for Gate Current (H. Lin, Y.-C. Sheu). 12. Software Tools and Environment Fault Tolerant Communication in Embedded Parallel High Performance Computing (G. Efthivoulidis, E. Verentziotis, A. Meliones, T. Varvarigou, A. Kontizas, G. Deconinck). Methodology for Construction of Numerical Wind Tunnel on Distributed System (F.-P. Lin, K.-C Huang). Parallel Tree Code Library for Vortex Dynamics (P. Liu). COUPL and its Use within Hybrid Mesh CFD Applications (T. Schonfeld, M. Rudgyard). 13. Unstructured Mesh Applications. An Adaptive Least Squares Finite Element Method for Navier-Stokes Equations (M.-C. Hsieh, I.-J. Lin, J.-L Liu). Parallelisation Pressure Correction Method on Unstructured Grid ( T.M. Lin, J.K. Lee, K.L. Wu, C.A. Lin, V.C. Chuang). Partition Alignment in Three Dimensional Unstructured Mesh Multi-Physics Modeling (K. McManus, C. Walshaw, S. Johnson, M. Cross). A Fictitious Domain Method with Distributed Lagrange Multipliers for the Numerical Simulation of Particulate Flow and its Parallel Implementation (T.-W. Pan, V. Sarin, R. Glowinski, A. Sameh, J. Periaux). Unstructured Grid CFD on Numerical Wind Tunnel (E. Shima, A. Ochi, T.Nakamura, S. Saito, T. Iwamiya). Parallel Dynamic Load-Balancing Algorithm for Adaptive H-Type Unstructured Grid (F. Yeh). 14. Water Resources and Environmental Flows. Depth-Integrated and Three-Dimensional Modeling of Fine Sediment Transport in the Seine Estuary, France (I. Brenon, C.S. Yu). Parallel Computation for the Stochastic Optimal Operation of a Multi-Reservoir System (C.-T. Hsiao, L.-C. Chang). Parallel Quasi-Three Dimensional Finite Element Method for Shallow Water Flows Utilizing the Mode Splitting Technique (Y. Ohba, K. Kashiyama, T. Takagi). A Parallel Implementation of East Asia Weather Forecast System (S.-C. Tcheng, H.-Y. Chang, J.-L Chen, K.-Y.Hu, H.-W. Jyan, H.-C. Li, S.-M. Deng) Modeling Tidal Flows in the Northwest European Continental Shelf Seas on Parallel Computers (C.S. Yu, J. Berlamont).